India today launched four world class Broadband products by C-DOT. With this India has become at par with all other developed countries in the world in respect of quality telecommunication services and effective penetration of advanced broadband based services. Union Minister for Communication and IT, Ravi Shankar Prasad while launching the new products indigenously developed by C-DOT today stated that the NDA Government is committed to bring all 2.5 lakh villages under broadband services and enhance internet penetration from 300 million to 500 million within 2 and half years. Shri Prasad launched the products in the presence of his Kenyan counterpart, Cabinet Secretary, ICT in a function organized at C-DOT Campus, New Delhi. 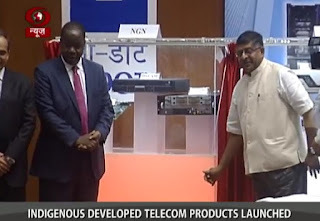 Shri Prasad further stated that the new products have been launched with an aim to provide an advanced digital infrastructure for digital India Initiative launched by the PM Shri Narendra Modi earlier this week. He further stated that Digital India initiative is bound to bring governance available in the palm of every Indian. It is more for the poor, underprivileged and the marginal people like masons and carpenters etc. In fact, Digital India is a transformational programme and a dream to bring a positive change. The initiative would also go a long way in digital empowerment of the people of India. The initiative launched by the Prime Minister would make India developed, globally credible, affluent and would further synch with Make in India and Skill India programme. Shri Prasad while elaborating the importance of skill development stated that there are ample opportunities of earning in mobile maintenance profession as the number of mobile sets are surging day by day. Shri Prasad appreciated the role of C-DOT in transforming the telecommunication scenario in the country, especially in the rural India. C-DOT has to render significant contribution in providing broadband coverage across the nation. He also appreciated the products developed by the C-DOT and stated that the long distance Wi Fi is going to solve the problem of distance, whereas Solar powered Wi Fi would do away the dependence on the power availability. Shri Prasad stated that the Next Generation Network technology is quite important for the service providers for converging landline/ mobile/ data network. The MTNL and the BSNL are going to be benefitted as they would be able to transform their landline network into the most advanced network. He called upon C-DOT to come out with more advanced innovative products in order to ensure foolproof telecom services apart from lending a hand in ensuring digital literacy across the country in respective local languages. The Union Minister further stated that digital connectivity leads to good governance. Shri Prasad also stated that the C-DOT products are great innovative and dependable but I would be happier if the products are savvy and are used by more people. He exhorted the private sector to go for C-DOT products on large scale as these have been developed after a sustained research and analysis for which the Government invested a substantial amount keeping in view the need to match with the fast changing world. Kenyan Cabinet Secretary, ICT, Dr.Fred Marang’I Okengo stated that his country has been following Digital India very closely. The launch of the new C-DOT products has testified the audacity of the ongoing innovative programs. He stressed the need of focus on the IT jointly by both the countries. The visiting dignitary stated that our country is keen to pursue the capacity building and is committed to expand the innovative programs with constructive cooperation. He described the ICT initiatives as game changers in making the lives of the people purposeful and comfortable. While appreciating the broadband network developed by the C-DOT he stated that it would go a long way in unlocking the potentials of our people in transforming the country. He also stressed upon the M Money and M Paisa programs which enable transparent and fast transfers. He described his country as an ICT hub and a gateway to Africa. The visiting dignitary assured a broader, detailed, effective collaboration in the field of communication and IT. He expressed his keenness in transfer of new C-DOT products to his country and sought assistance of India to find out feasible ways so that these could be launched in Kenya. On this occasion, the Telecom secretary Shri Rakesh Garg, in his key note address expressed hope that the private sector would pick the C Dot products. He added that the new products have been tested prior to their launch. He called upon the C Dot to design the products that suits Indian requirements and conditions. The next generation land line network would not only revolutionize the basic telephony but would upgrade the entire landline services. He added that presently all gram panchayats are connected with broadband, the government is committed to connect all gram panchayats in the country with broadband. Our efforts are in the way of taking dream of Digital India further, said Shri Vipin Tyagi, Executive Director, C-DOT while delivering his welcome address. He also stated that the C-DOT has been innovating with an aim to empower the weaker strata of the society and developing indigenous products to facilitate continuous telecom up-gradation. He said that technology is big enabler and broadband is big leveler. Roti, Kapda, Makan and Broadband are the basic needs of the human being. Two Wi-Fi products launched by C-DOT viz. Long Distance Wi-Fi and Solar powered Wi-Fi address the connectivity problem of rural areas, hilly terrain, highways, dense vegetation, tunnels etc. They are also suited for greenfield projects like smart cities, areas where there is little/no grid supply, emergency situations, Disaster Management Networks etc. C-DOT has also developed a light weight Green Power Source to make the solution self-sustainable. Using this solution, reach of BharatNet can be increased beyond Panchayats to the remotest part of country. 100 Gbps OFC link system called “Suteevra” addresses the telco’s requirement of optimizing communication transport backbone in smart cities, IT parks, Industrial Complexes, Inter City Traffic, Data Centres etc. It offers ease of deployment, lesser shell space & lower power consumption, and saves on the high cost of laying fiber for each individual user. Further, SUTEEVRA is capable of serving multiple applications and protocols ranging from the Data, Storage, TDM and Video networks. C-DOT NGN in MTNL network is advanced IP based network which is designed to replace existing TDM network due to ease in introduction of newer services. NGN provides a centralized remote control to the operators to manage the exchanges thereby providing better services to the end subscribers. Besides, there are considerable savings in the power consumptions with the introduction of the much smaller and low power consuming equipment. All interfaces and various types of gateways have been indigenously developed by C-DOT. The solution has been deployed in the MTNL network at Delhi and Mumbai for supporting migration to IP for 1000 subscribers at each location. The IMS compliant NGN Core has been installed at Minto Road (New Delhi) and Prabhadevi Building (Mumbai). The subscribers are distributed at the Hauz Khas and Worli exchanges in Delhi and Mumbai respectively. With this successful trial, MTNL can think of launching various services (voice, video and data) through various access modes based on IP. Also, it is now possible to shift existing 3.5 million landline subscribers of MTNL to IP based network. The Government has made a significant move towards the conservation of the landscape of Western Ghats and its unique biodiversity. The Minister of State (Independent Charge), of Environment, Forest and Climate Change, Shri Prakash Javadekar has called a meeting, here tomorrow, of the State Environment and Forests Ministers of the Western Ghats region viz. Gujarat, Maharashtra, Goa, Karnataka, Kerala and Tamil Nadu. The meeting will review the progress of physical demarcation of Ecologically Sensitive Area in Western Ghats and will discuss the further course of action for the protection and conservation of Western Ghats. The main focus of the meeting will be to conserve the biodiversity of the Western Ghats region, while providing adequate opportunities for livelihood security of the local people in the broad paradigm of Ecologically Sensitive Area, which is not just about regulation of development, but is intimately linked to positive promotion of environment-friendly and socially inclusive development. Based on the requests received from some of the State Governments of the region, the Ministry had decided to give an opportunity to State Governments of Western Ghats region to undertake the demarcation of Ecologically Sensitive Area within their jurisdiction by physical verification and submit their proposals to the Ministry by 30th June 2015, except for the State of Kerala, which has already undertaken such an exercise. The Ministry had published a draft notification in Gazette of India on 10th March 2014 under the provisions of the Environment (Protection) Act, 1986 for declaring Ecologically Sensitive Area in the Western Ghats in the States of Gujarat, Maharashtra, Goa, Karnataka, Kerala and Tamil Nadu. The identified Ecologically Sensitive Area represents a continuous band of natural vegetation, extending over a horizontal distance of about 1,500 km. along the west coast of the country. Western Ghats is a global biodiversity hotspot and a treasure trove of biological diversity harbouring many endemic species of flowering plants, fishes, amphibians, reptiles, birds, mammals and invertebrates. The Western Ghats not only harbour rich biodiversity, but also support a population of approximately fifty million people and also include areas of high human population density. Therefore, there is a need to conserve and protect the unique biodiversity of Western Ghats, while allowing for sustainable and inclusive development of the region. The concept of Ecologically Sensitive Area provides a mechanism to conserve biologically diversity of an area while allowing for sustainable development to take place. The Centre has asked the industry to avail of the benefits of the recently launched Capital Goods Scheme which would help in acquiring or developing new technology. Speaking at the inauguration of a workshop in Mumbai today, Union Minister for Heavy Industries and Public Enterprises, Shri Anant Geete expressed concern over increasing imports of Capital Goods. He said the technology gap between the developed countries and developing countries is widening in the Capital Goods Sector. The workshop on “Technology Development for Capital Goods: Constraints and the Way Forward,” was jointly organized by the Department of Heavy Industries and FICCI. The Minister said “the technological capabilities of large number of players, especially in the SME sector, are limited in India and as a result India has become one of the largest importers of capital goods in the world. This has adversely affected the indigenous capital goods industry and we want to change this now” he added. Shri Geete informed that his Ministry is committed to bring ‘Achche Din’ for the Capital Goods Sector and informed that his Department would set up Technology Adoption Fund to promote Research and Development in the industrial sector. The Capital Goods Scheme launched under the Make in India initiative of Government of India provides support to the industry to acquire technology, set-up technology development centres in collaboration with Institutes, and create common infrastructure for the capital goods industry. A unique component of the scheme is technology acquisition fund where government is giving support upto 25 per cent of the cost of technology subject to the limit of Rs. 10 crore. The Capital Goods Scheme is expected to be particularly helpful for the industry in Maharashtra as a large number engineering and capital goods clusters covering textiles machinery, machine tools, plastic machinery and engineering products are located in the state. Shri Divakar Raote, Maharashtra Minister for Transport, Dr. Rajan S. Katoch, Secretary, Department of Heavy Industries, were also present on the occasion. The Employees’ Provident Fund Organisation (EPFO) is on way of becoming a centre for excellence in governance. This was stated by Shri Shankar Aggarwal, Secretary, Labour & Employment here today while inaugurating EPFO’s new revamped website as a part of ‘Digital India Week’. Shri Aggarwal reiterated various initiatives taken by EPFO in the recent past to bring about a transformative effect on the benefit delivery mechanisms by adopting IT enabled tools and techniques. He further said that EPFO will become truly paperless and extremely subscriber/citizen friendly in the days to come. Universal Account Number (UAN) – The launch of UAN has enabled PF members to access a bouquet of services like dynamically updated UAN card, updated PF passbook including all transfer-in details, facility to link previous members’ ID with present ID, monthly SMS regarding credit of contribution in PF account and facility for auto-triggering transfer request on change of employment. Already, more than 4.64 crore UAN have been allotted and 58 lakh EPF members have activated their UAN. During the UAN campaign, approximately2.42 crore bank account details, 99 lakh PAN details and 58 lakh Aadhar / NPR numbers of PF members were captured by EPFO. Online Transfer Claim Portal(OTCP) has made transfer of PF accumulations from one account to another quick and online. Members can file their requests online and there is zero paper movement between the concerned offices of the organisation. More than 5.71 lakh claims have been handled through this facility. Centralized Monitoring of Compliance related functions has enabled online monitoring by field offices and Head Office. It provides data on defaults by establishments covered under the Act and enables the Organisation to track the status of assessments including levy of damages and also status of recovery and legal cases. Mobile platform based Short Code SMS Service was also launched which could be accessed by PF members who have activated their UAN. Using this service, member can send SMS to a specific number i.e 7738299899. The format of the SMS is EPFOHO UAN followed by first three characters of the preferred language. SMS alerts are sent to members for remittance, withdrawals, interest credit etc.Also, SMS is sent to employers for non deposit of dues. Auto-updation of members’ accounts has enabled the organization to update more than 14.5 crore accounts for the year 2014-15 in the beginning of the financial year itself. Earlier Shri K K Jalan,CPFC welcomed the guests. Shri Harish Gupta, EPF Appellatet Tribunal Senior officers from the Ministry and EPFO were present.